This Saturday I atteneded the North American Organic Brewers Festival. After getting my tokens and cup the first thing I saw was the incredibly long line for the bathrooms, and it bewildered me. For some reason the crowd had organically formed an incredibly long, single file line for the bathrooms. There was no signage or instructions to form a single line but there it was. Eventually people figured out it was faster to just form a bunch of lines at each stall later in the day. 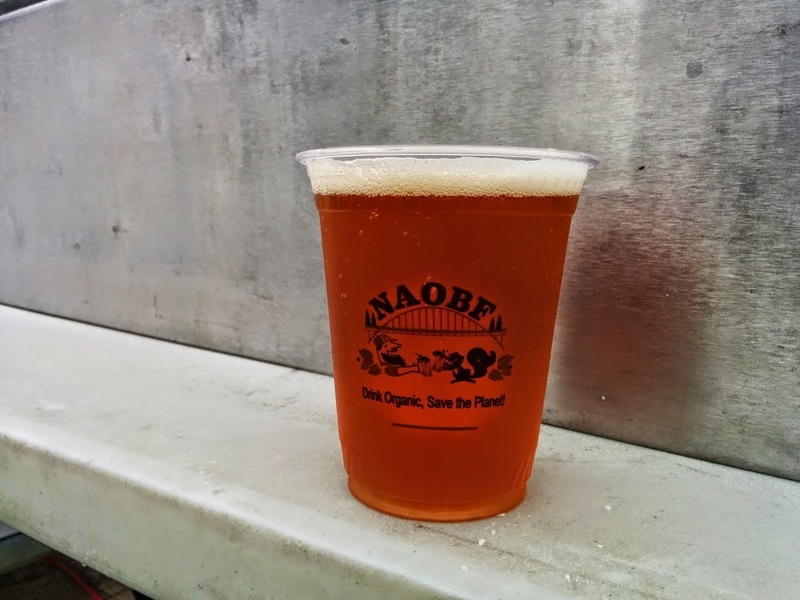 The cup for this festival was a biodegradable and compostable cornstarch and emblazoned with the NAOBF logo. I couldn't tell any difference, it looked and felt like a standard plastic cup. It was clear too which made it easier to see the beer. I actually preferred it to the hard plastic mugs a lot of other festivals use. The festival had lots of food vendors as well as a Chipotle sponsored kids area under the big shade tree in Overlook Park. A light wheat beer with a strong aroma of açaí, pomegranate and other berries very refreshing beer. A reddish colored rye ale with a ton of rye character and spiciness. I would have probably liked it better with maybe a little less rye but I can't fault a rye beer for having too much rye. Tried something new and was not rewarded. This beer is 70% Hub Lager and 30% lemonade; adding a little lemon flavor to a beer can be a nice addition but for me, 30% is way too much. This yellow cloyingly sweet beer was more like a pop than a beer, heavily carbonated and very strong lemonade smell and flavor. This dark brown beer had toasty roasted flavors and light carbonation. The hop profile was nice using Cascade and Centennial hops. The beer also had a light rye character that was slightly muted from the roasted grains but still present. The first thing I noticed about this beer was the aroma. I don't know why but the only thing I got was a strong smell of garbage, essence of dump. A cloudy yellow beer tasted ok having some orange and coriander flavors but I just could not get past the smell. Pretty good beer. Clear yellow nothing really stood out other than the claim that it used Salmon Safe Hops. Best in show! Looking at this clear golden ale I was prepared for another lightly hopped pale ale with a crisp clean finish, I was so wrong. A huge chocolate and vanilla nose eruption immediately consumed my nasal passages. Unlike anything I had smelled before sweet and chocolatey this beer had a terrific nose to it. Followed up by a flavor that should never have come from a beer this light. This flavor was provided by whole vanilla beans and TCHO cocoa nips which explains why there was not dark color since neither raise the SRM of a beer just infuse with tons of flavor. A delicious beer with a clean malt bill that allows the hop character to shine. Careful malt selection creates great mouthfeel, while the use of only one hop variety, right down to the dry-hop addition, makes for a great summer beer experience with dank Crystal bitterness and aroma. This cloudy yellow beer had a medium body with a smooth mouthfeel. The hop aroma was slightly skunky, although to clarify it did not smell light struck though more like a dank mustyness from hops. A clear pale beer with a nice balanced sourness to it provided by Lacotobacillus and the Golden Valley house Kolsch yeast. It was moderately sour but did not have any pucker to it just enough to be a sour beer. A slight strawberry flavor was in the aftertaste that was very pleasant. The last beer I had as the sun was going down was this double token beer. Ambacht got a hold of some Hair of the Dog barrels use make Adam from the Wood. The beer was aged in these for nine months. This lightly sour beer has a nice mellow bourbon aroma and flavor not too much oak character that I could find but it was the last beer of the night so my senses had probably been dulled. This was my first NAOBF but I'll definitely be going again the lines are incredibly short unless you are talking about the bathroom line, but that got figured out later. The range of beers was pretty heavily leaning towards the lighter summer beers which was good because for most of the day it was pretty hot. It started to rain briefly and the crowd started to cheer, I would imagine because of the inevitability of rain in Portland at almost any event. Overall a great time with a nice selection of high quality organic beers.